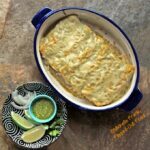 Green Chile Turkey Enchiladas are a creamy, decadent way to use up your leftover roast turkey or chicken. We’d always have tons of food left over: so, we would use our turkey leftovers in a post-Thanksgiving enchilada dinner. The friends (with beer close at hand) formed an assembly line: tortilla frying, tortilla saucing, tortilla loading and rolling, and then cheesing, saucing, and baking. The Friendsgiving leftover turkey enchiladas were red, but I like the decadence of green enchiladas. (If you prefer red enchiladas, check out my Red Enchiladas or Chilaquiles recipe.) This version has a creamy, roux-based sauce with cumin, Mexican oregano, shallots, green chiles, turkey stock, and sour cream. It’s out of this world. Since this recipe is written with holiday turkey leftovers in mind, I use my rich Crockpot Turkey Stock to make the sauce. Pressure Cooker Chicken Stock also works great. If you don’t have homemade stock handy, you can use store-bought turkey or chicken stock. Although leftover holiday turkey is delicious in this recipe, it would be just as good with your leftover roast chicken. For cheese, I use a mix of quesadilla cheese and cotija, but you could also use Monterey jack (really just about any good melting cheese) or a mix of cheeses. Corn tortillas are a must: they hold up to the sauce far better than flour tortillas. Rather than frying them, use a quick microwave to make them more pliable. Dipping one side in sauce makes them even easier to work with. One note on kid friendliness: I’ve found from our picky eater that many kids don’t like non-sauced bits of tortilla that turn brown and crispy (a.k.a., “burned”) during baking. With that in mind, I make sure to sauce ALL parts of the rolled tortillas when the kids are eating with us. 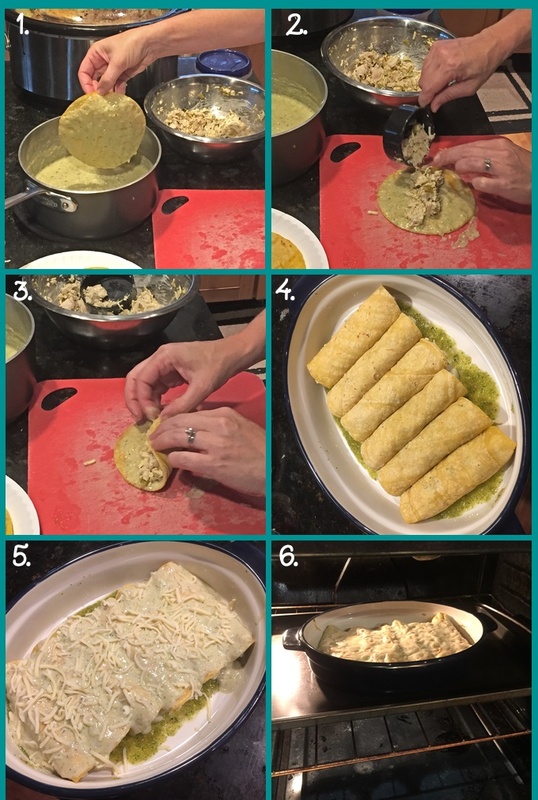 Assembling Creamy Green Chile Turkey Enchiladas: 1. saucing the corn tortillas; 2. adding filling to the “sauced” side of the tortilla; 3. rolling up the enchilada; 4. a baking casserole with rolled enchiladas; 5. smothering the enchiladas with sauce and cheese; 6. baking the enchiladas. A couple of notes about the assembly photos: 1. I was making a smaller batch of enchiladas and saving the extra filling for another meal (it freezes well for an easy meal later on!). 2. I wanted the shape of the enchiladas to be clear for photography purposes, so I didn’t go nuts with saucing or cheesing. Don’t hold back with yours! 3. I was using up some salsa verde, so that’s the green color you see on the bottom of the dish. For your enchiladas, use the cream sauce. 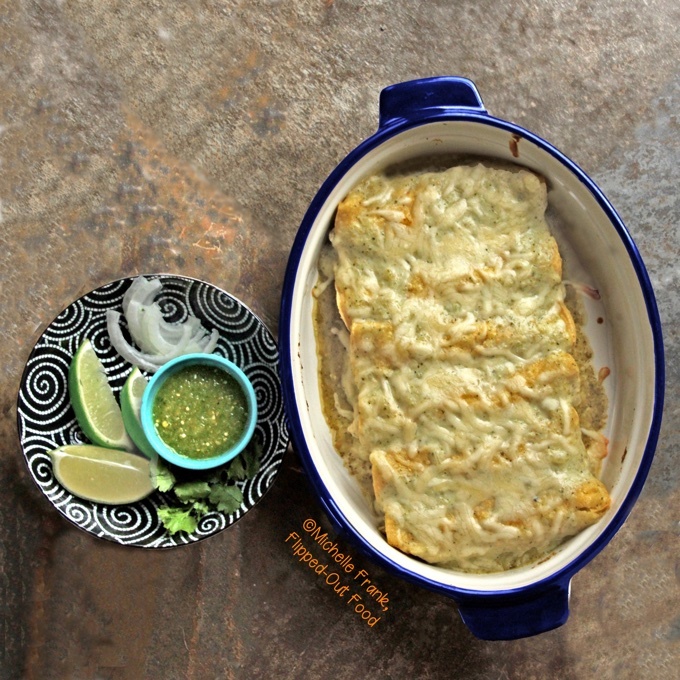 If you don’t have time to roll out each enchilada, you can always serve casserole-style green chile turkey enchiladas. Simply make a layer of corn tortillas on the bottom (sauce both sides; you’ll have 6 or so tortillas). Next, spread the filling in an even layer on top of the tortillas. Then, add another layer of tortillas (again, 6 tortillas; sauce both sides). Top with more sauce and cheese, then bake until bubbly. It’s not as pretty, but you won’t care once you have a taste! My must-have garnishes for green chile turkey enchiladas include Mexican crema or sour cream, shredded lettuce, salsa verde, lime wedges, sliced onions or scallions, chopped cilantro, and crumbled cotija cheese. And that’s all there is to it. Green Chile Turkey Enchiladas are a bit more involved than my usual Flipped-Out Food-style recipe. But they’re SO worth it. If you need more ideas for how to use up your leftovers, check out my post, Using up Leftovers! #CookBlogShare, a great food blogger recipe-share hosted this week at Easy Peasy Foodie. Creamy Green Chile Turkey Enchiladas are a delicious way to use up your roast turkey or chicken leftovers. Assembling the enchiladas is a fun activity with kids, or with your "Friendsgiving" or holiday dinner guests. You can make the cream sauce in advance to simplify your workflow at dinnertime! Melt the butter in a heavy-bottomed saucepan over medium heat. Add the shallots and sauté until translucent and softened, 5–7 minutes. Mix the flour into the butter and shallots, stirring continuously. Cook for 1 minute, then mix in the 1/2 cup of the chiles, oregano, cumin, salt, and pepper. Slowly add the stock, whisking constantly. When the sauce begins to simmer, reduce heat to low. Simmer gently until thickened, about 10 minutes. Place the sour cream in a small bowl: temper it by slowly mixing in 1/4 cup of the simmering sauce. Stir the mixture into the sauce in the pan. The finished sauce should be fairly thick. See Recipe Note #4 for work-ahead. Preheat the oven to 400º. Mix the cheeses in a bowl; combine the turkey, 1/2 of the cheese mixture, salt, pepper, and the remaining chiles in a mixing bowl. Pour 1 cup of the cream sauce into the bottom of a ~9x13" baking dish and spread evenly across the bottom. Wrap the tortillas in paper toweling and microwave for 20 seconds on high to soften. When all of the enchiladas are rolled, spoon the remaining sauce over the top and sprinkle with the remaining cheese. Cover the baking dish with foil and bake for 15 minutes. Remove foil and continue baking until the top of the enchiladas is golden and the sauce is bubbling. Serve immediately with the garnishes of your choice. I love Hatch green chiles, if you can find them. Go for mild to medium heat, based on your level of heat tolerance. If you're concerned, start with a tablespoon of the chiles and adjust to taste. Even if the chiles are pre-chopped, I chop them even finer for a smoother sauce. This is a great time to have freshly-made turkey stock on hand, like my Crockpot Turkey Stock. If you don't have any available, just use your favorite chicken broth. You can serve these enchiladas casserole style: sauce both sides of 6 corn tortillas and arrange across the bottom of a 9 x 13" casserole dish. Spread the filling in an even layer to cover the tortillas. Top with 6 more corn tortillas (sauced on both sides). Cover with more sauce and sprinkle cheese on top. Bake as with the rolled enchiladas. The sauce can be refrigerated in an airtight, microwaveable container and reheated if you're working ahead (to reheat, microwave at 50% power until warm, stirring every 2 minutes). Reference the preparation collage in the post above for assembly technique! Any leftover filling can be frozen for up to 2 months for an easy meal down the road! Sounds amazing! Thanks for sharing at the What’s for Dinner party! And yes I would prefer green sauce. We love Mexican food!! we were at vacationing at Los Cabos two weeks ago and I enjoyed Mexican food a lot.Your casserole looks awesome! Looking forward to giving it a try! Looks fabulous! A great way of making another dinner out of leftover turkey. Must be nice to have all these Mexican ingredients available where you live. I’ve never tasted Mexican oregano. Thanks, Monika! Yes, I am lucky to be able to easily find Mexican ingredients. The oregano isn’t make or break: you could use regular oregano or simply leave it out. I’ve decided I just need to move to America to get all the tasty ingredients. A year or so ago, my husband went to the US for business and he stopped off at a Walmart and picked me up about 6 tins of roasted green chiles. I ran out ages ago and wonder if I can send him back to Walmart on his next trip at the end of the month..These look delicious as all your recipes do! Wow, Cat! I never realized just how spoiled I am with having Mexican ingredients available at my local grocery! If you can get hold of fresh green chiles (poblanos work best, IMO, but I’m not sure what you have available), you can roast them yourself and then keep them in the freezer for emergencies like this! (You probably already know all this, but I’m putting it here because someone else might find it helpful!) I like to put the chiles in a foil-lined baking pan set under the broiler until the skin starts turning black and blistering up, then flip and repeat on the other side. Then I transfer the chiles to a paper or plastic bag for a sweat (about half an hour). Then I peel, stem, and seed the chiles before popping them into a freezer baggie. If you can’t find poblanos, jalapeños can work—but proceed with caution, since they can be quite hot. I haven’t tried it myself, but you could probably cut the jalapeños with some roasted green bell pepper to temper the heat. 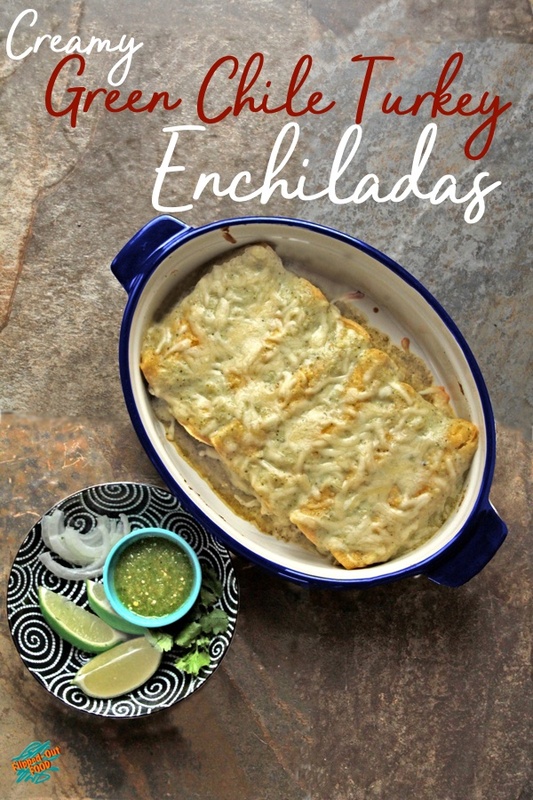 These enchiladas sound so good and I love the idea of making them with friends in a production line kind of way! Thanks for sharing them with #CookOnceEatTwice! Thank you, Corina! It is a really fun activity!